A relatively small number of viewers watched the movie when it was released. Later, Kin-dza-dza! took on an interesting life and the words from the film’s invented lexicon began to spread. 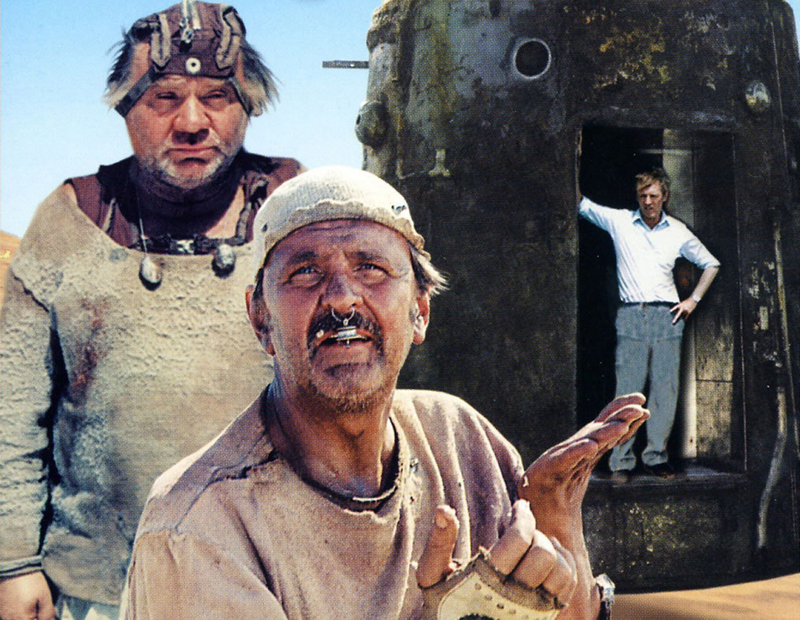 In the mid-1980s the master of Soviet "sad comedy" decided to shoot a film in a genre that was unfamiliar to him and to Soviet cinema in general. The result was a 1986 science fiction satire that 30 years later many Russians think is still relevant. While the whole world was watching Star Wars and Mad Max in the early 1980s, Soviet cinema rarely turned to science fiction. Yet in 1981 the country, or at least its young generation, watched Richard Viktorov’s movie Through the Thorns to the Stars, whose genre allowed the director to show utopian dictatorial civilizations without him fearing to enrage the Communist Party and the government. Director Georgiy Daneliya was already over 50 years old when he decided to shoot a "youth" movie. Later, in interviews, as well as in his autobiography Tostuemiy Pyot Do Dnya (“The Honored Drinks to the Bottom”) (2006), the director remembered the details of how the movie was made, which people continue to ask him about to this day. One of the most visionary sources for social parallels and conspiracy theories, the latter Soviet-period film was born during a conversation that Daneliya had with Italian screenwriter Tonino Guerra when he was visiting Moscow. When Daneliya asked Guerra what kind of film he should make for a young audience, the screenwriter replied that it would be good to make a science-fiction film, something with a lot of sun and heat – such a film was bound to be successful in a country where the winter lasts for six months. In the film, foreman Vladimir Nikolayevich Mashkov is asked by his wife to go to the store to buy some macaroni and bread. On Moscow’s Novy Arbat he meets a student named Gedevan whose nickname is Skripach (Levan Gabriadze) and a barefooted alien traveler (Anatoly Serenko), who takes him to a desert planet. There he starts persuading locals Uef (Yevgeny Leonov) and Bi (Yury Yakovlev) to help him return to Earth. Kin-dza-dza! is a very personal film that did not feature a professional cast – just people who happened to be to hand. For example, the role that famous Russian actor Rolan Bykov turned down due to other engagements was played by the film's producer. The scenes in Mashkov's apartment were filmed in the producer's apartment. There are also roles played by the film's director of photography and set designer, while Mashkov's wife was played by Daneliya's wife and assistant director Galina Daneliya-Yurkova. The director himself even played the robot Abradoks after not being able to engage Sergei Bondarchuk and Innokenty Smoktunovsky for the role. Soviet reality frequently interfered in the shooting process of Kin-dza-dza! While the film was being shot the Soviet authorities declared a war on alcoholism and the chacha (Georgian grape vodka) that Skripach was carrying had to be changed for vinegar. Two hundred bright lamps were needed for the costumes worn by the alien Ecilops police, lamps that could not be found in the Soviet Union. Daneliya asked Viktor Grishin, who was then first secretary of the Moscow City Council, for help in obtaining the lamps. But Grishin refused. Daneliya later asked future Russian president Boris Yeltsin, who had replaced Grishin at the council after the latter was fired. The director managed to convince Yeltsin, who finally procured the lamps, and later used to say that it was the lamp incident that cost Grishin his job. Kin-dza-dza! was released in USSR movie theaters on Dec. 1, 1986. A total of 15.7 million viewers – a relatively small number in those days – watched the film, which ranked only 14th in box-office takings in 1987. But later, as often happens to cult films, Kin-dza-dza! took on an interesting life and the words from the film’s invented lexicon began to spread. In 2008 a song from the film was used in a Snickers commercial and in 2013 Daneliya filmed a cartoon remake, Ku! Kin-dza-dza. But the film's biggest influence was noticed during the 2010 census of the Kursk Region in which some residents described themselves as "patsakami," a term that combines the words katsapi (a derogatory term used in Ukraine for Russians) and patsani (meaning “guys”). So many years have gone by and some people still joke that they inhabit Daneliya's world for real.